Asturias (/æˈstʊəriəs, ə-/; Spanish: [asˈtuɾjas]; Asturian: Asturies [asˈtuɾjes]; Galician: Asturias), officially the Principality of Asturias (Spanish: Principado de Asturias; Asturian: Principáu d'Asturies), is an autonomous community in north-west Spain. It is coextensive with the province of Asturias, and contains some of the territory that was part of the larger Kingdom of Asturias in the Middle Ages. 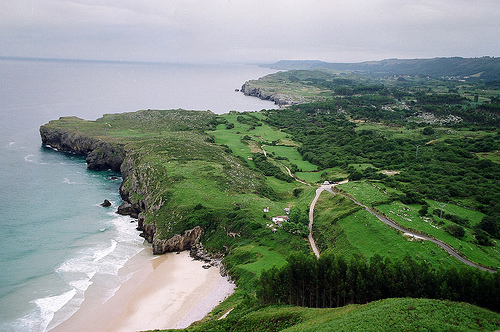 Divided into eight comarcas (counties), the autonomous community of Asturias is bordered by Cantabria to the east, by Castile and León to the south, by Galicia to the west, and by the Bay of Biscay to the north.